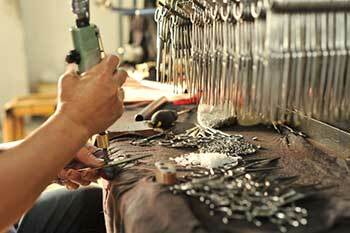 We can source parts from multiple factories, perform assembly, and final packaging. One of our customer’s products has nine different factories involved. Our partner companies in China manage the entire manufacturing process from start to finish. Grinding (centerless, CNC, cylindrical, form, gear, surface, thread, and more). Finishing of all types; chrome plating, electroless nickel plating, zinc plating, anodizing, black oxide, hard chrome plating, and more. Sources that can produce product in a wide range of materials, including plastics, metals, wood, rubber, textiles, stone materials, glass, ceramics, and more. China’s average manufacturing rate is $2.00 an hour, vs ten times that and more in Western countries. Molds typically cost 80-90% less to make in China, saving thousands of dollars in start up costs. We work with many contract manufacturing China companies that can produce large volumes of parts. Our partner companies in China will inspect the shipments. Additionally, we have contracted with an independent, third party inspection company that can provide on-site inspections and provide a report, complete with pictures, of their findings. We just need your drawings or a sample to get a free quote. Ready to get started? Contact Us now to discuss how we can help you leverage contract manufacturing companies in China.